Much like the Path of Dominance, the history of the Path of Salvation began long before the Exodus. In fact, the Purgatory, their subterranean home, used to be a massive underground shelter protecting a large group of survivors after the Day of Purgation. These survivors, mostly due to the pressure of Drokhaton, their charismatic self-proclaimed leader, refused to return to the surface, even after Sun’s Breach. Drokhaton claimed that the Day of Purgation was in fact God’s vengeance upon humanity, and it’s only them, the faithful, who were spared. Over the years of living underground, his influence kept growing, and as the people were expanding the shelter using materials salvaged from the surface. Venturing outside was a privilege only to Drokhaton and his inner circle, so the people’s idea of the surface world and life slowly faded away, and the admiration of Drokathon and his religious teaching took its place. Today, the Purgatory, the breathtaking underground realm of the Path of Salvation, is a vast network of halls, tunnels and caverns, sprawling miles deep beneath the surface. The huge subterranean halls are dimly lit with sunlight, channeled in through grooves hollowed in the rocks. These grooves are filled with diamonds and other kinds of gems – perfect materials for transmitting light, without any financial value in the new world. The subterranean city gives the mixed impression of a medieval settlement equipped with modern technology. Power and hot water are supplied by geothermal plants deep below the cityscape, circulated through Purgatory in a massive pipeline network. Living underground for generations had made the denizens of Purgatory adapt to the harsh circumstances – not only mentally, but physically as well. They are pale, short in stature but incredibly strong and tough. Over the decades, their sight gradually weakened in the dimly lit environment, but their hearing and smelling became much better than that of the surface dwellers. Most of their citizens do not have much concern about their looks – they dress in a simple and functional way, much like the monks of the Old World. Every half year in the surface world is one cycle underground. At the end of each cycle, people of the Path gather in the Great Hall of Purgatory for the most important religious celebration in their culture: the Day of Miracles. On this day, the Shepherd, dressed up in ceremonial clothing, stands in front of the people – and performs miracle after miracle. Seemingly out of thin air, he conjures water, food and resources for the awestruck crowd, declaring them God’s gifts. The Day of Miracles usually ends with a great feast and celebration – and the Shepherd’s unquestionable authority as God’s chosen for the upcoming cycle. The truth behind the Day of Miracles is the Drokhaton Dynasty’s most carefully preserved secret. In the early days of Purgatory’s construction, a strange substance was discovered during an excavation. Drokhaton immediately confiscated the samples, and his inner circle started examining it. That substance is known as Neutronium today, and while its incredible power is a recent revelation for the other three Paths, the leadership of the Path of Salvation has in fact known and used it for decades - to consolidate their power. The Day of Miracles is actually a carefully prepared show-off of Neutronium’s capabilities, and “God’s Gifts” are in fact the Path’s own resources warped in from the future. Naturally, few among the Path’s society are aware of this truth. The average citizens of Purgatory live their lives in a blissful ignorance: they are certain that they are walking God’s path, guided by their benevolent Shepherd, and since they never set foot on the surface, the only life they know is that in the Purgatory. They live, dress and eat simply: the food grown in the Path’s greenhouse-like facilities has everything to maintain their mental and physical health, but it is nearly tasteless – for the members of the Path, eating is just a mean to fuel their body rather than a source of enjoyment. Since they deny the existence and the general knowledge of the Old World, they learn only what the Path’s Clergy teaches - there are no books, notes or memos from the time before the Purgation. The Clergy is a respected social class, with knowledge unimaginable for the common citizen. Their stories and lectures play a very important role in shaping the society. Despite of their conviction and peculiar ways, the Path of Salvation cannot live in complete isolation. Connecting with other Paths, and venturing to the Outback is often necessary, and not only for resource gathering and diplomatic reasons. The Path of Salvation firmly believes that the other Paths need to be introduced to God’s ways, so converting others to the true faith is also a very important goal of these expeditions. Needless to say, not everyone is allowed to leave to the surface – the expeditions can only be undertaken by the Order of the Sunwalkers, a select group of the most loyal and faithful followers of the Path. 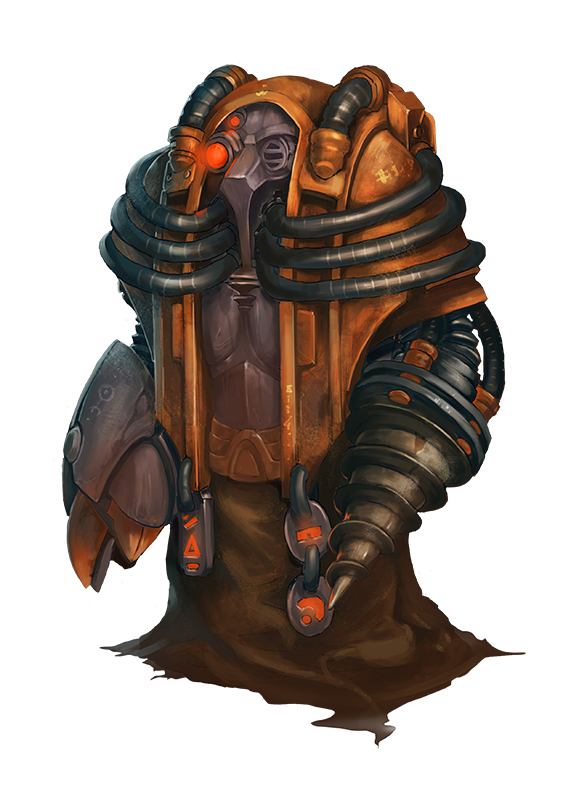 Only the Sunwalkers are trained to pilot the Pilgrims, the Path of Salvation’s massive Exosuits. The High Sunwalker is also a member of the Drokhaton Dynasty - he or she is chosen from the Shepherd’s siblings, and thus holds the second most powerful position in the Path’s society. Those admitted into the Order must take the Oath of Silence, vowing never to speak of what they hear or come across while doing missions in the upper world. 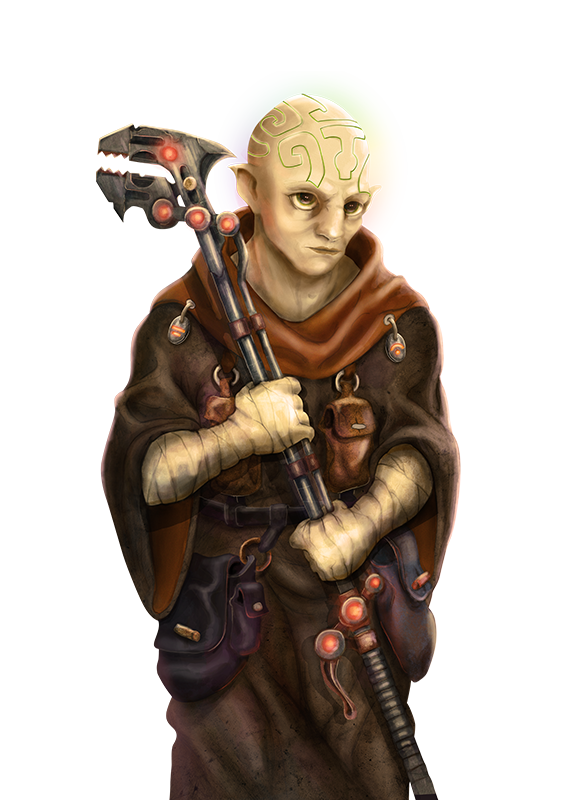 The Sunwalkers are specifically trained in conveying their unshakeable faith to the masses – their conversion missions are often successful, and they return to Purgatory with new followers by offering comfort, safety – and salvation. The most successful conversion mission was in fact the Exodus itself, when the Sunwalkers (called Redeemers by outsiders at the time), lured hundreds of insecure Capital citizens to Purgatory, hopeful for a better life. What the newly converted outsiders don’t know is that in order to join the Path of Salvation’s society, they have to take part in an initiation process, where they have to drink a potion made of a special kind of fungus growing in the tunnels. This procedure strips them from their memories of the previous life – only then can they truly begin to walk God’s Path. Thanks to their advanced knowledge of Neutronium and its powers, the Day of Reminiscence, and the message about the coming impact did not come as a surprise for the Path of Salvation. While the other Paths saw the beginning of a new, sinister era, the witnessing Sunwalkers only smiled – they were seeing God’s will manifesting. The Path of Salvation is not afraid of the impact. They know, with an unshakeable certainty, that they will be spared as God’s wrath sweeps away the heathens. And when that time comes, they will be ready to start anew, leading all survivors to the one true Path of Salvation. 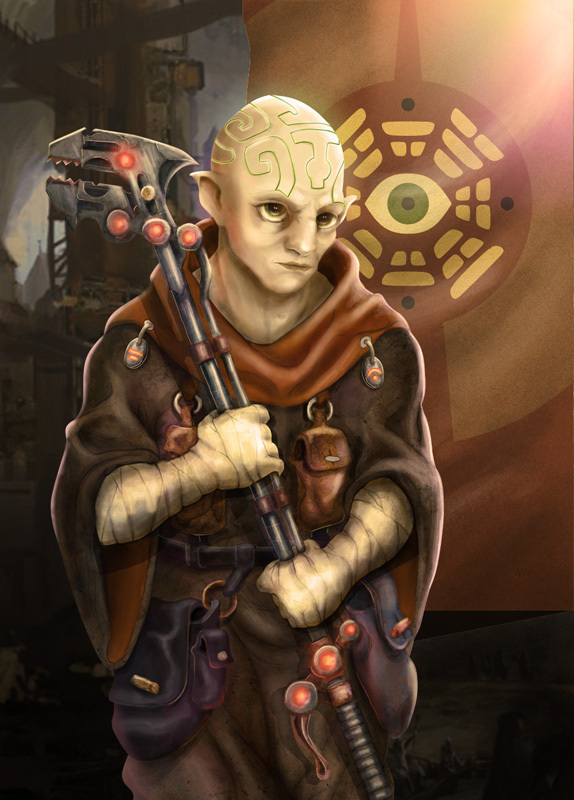 As the current Shepherd of the Path of Salvation, Caratacus Drokhaton leads his people with unwavering commitment. Beside preserving the tradition of the Day of Miracles and the Dynasty’s strong relation to God, he always acts righteously and justly and constantly teaches his people to do the same. He has a strong sense of responsibility for the well-being and the prosperity of Purgatory and its citizens. Caratacus thinks of Neutronium as God’s greatest gift. According to popular belief, the precious material can only be used to travel back to the past, but Caratacus had plenty of time and willingness to experiment with time travel, and secretly developed a forward-looping technique that can open the Rift to an infinite number of potential futures. And he did not stop there: he was convinced that for the sake of his people, it is his responsibility to peek into these futures and see what they may hold for the Path of Salvation. While some of these futures are bright and hopeful, others hold unspeakable truths that Caratacus is hesitant to speak of, and his spirit breaks a little every time he comes back. Like his sister, Caratacus also has his own scars, though they are much less apparent. Nonetheless, the responsibility he feels for his people and their future makes him strong enough to keep on going. Caratacus is the twin brother of Amena, being five minutes younger than her. They had always been close, right from the beginning. Their spiritual bond is so strong that they always sense the other’s emotions and feelings, even when they are far away. When Amena lost his right arm, Caratacus was somewhere else in the time stream, but he could still feel the pain and the shock Amena experienced. Since the accident, every now and then Caratacus’ right arm still aches when Amena feels phantom pain. Every time this happens, it hurts him so much that he can’t even move his arm. In order to bear through these periods, he redesigned his staff, a symbol of the mighty Drokhaton Dynasty, into a working tool that’s temporarily capable of replacing the functions of a second arm. No one in the Path of Salvation knows the surface world and its inhabitants better than Amena, the cunning, charismatic leader of the Order of the Sunwalkers. As the elder twin sister and right hand of the Path’s Shepherd, Caratacus, it is Amena’s task to lead the Sunwalkers on expeditions and diplomatic missions to the surface. While the people of the Capital are generally suspicious (and sometimes hostile) to the dwellers of Purgatory, Amena’s status is different: she is well-recognized and respected in the city for her refined diplomatic skills. As a member of the World Council, it is only thanks to her efforts that the Path of Salvation is eligible for the same water quotas as the other Paths, and that their reputation in the Capital is slowly but surely growing since the Exodus. 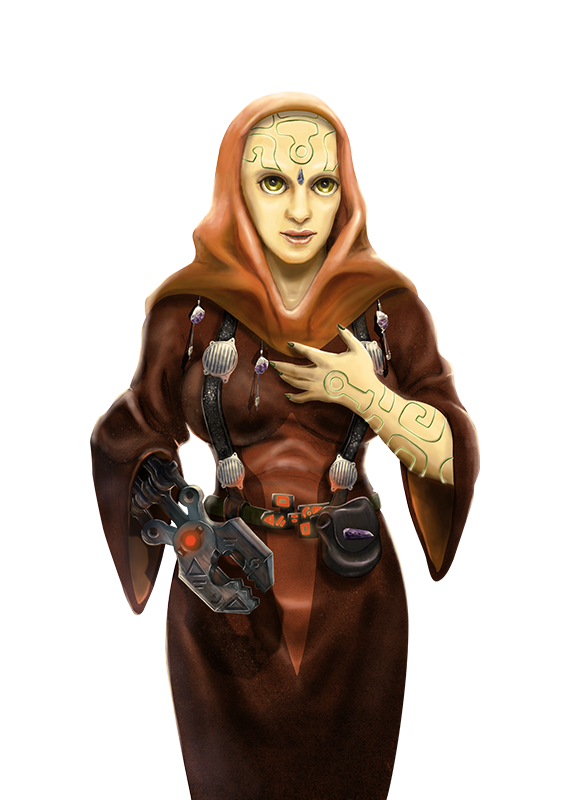 Apart from her diplomatic skills, she is one of the Path’s most gifted engineers. She constantly (and sometimes recklessly) tinkers with and perfects the Pilgrims, the Path’s Exosuits, even since the malfunction of a prototype Digging Claw cost her an arm. 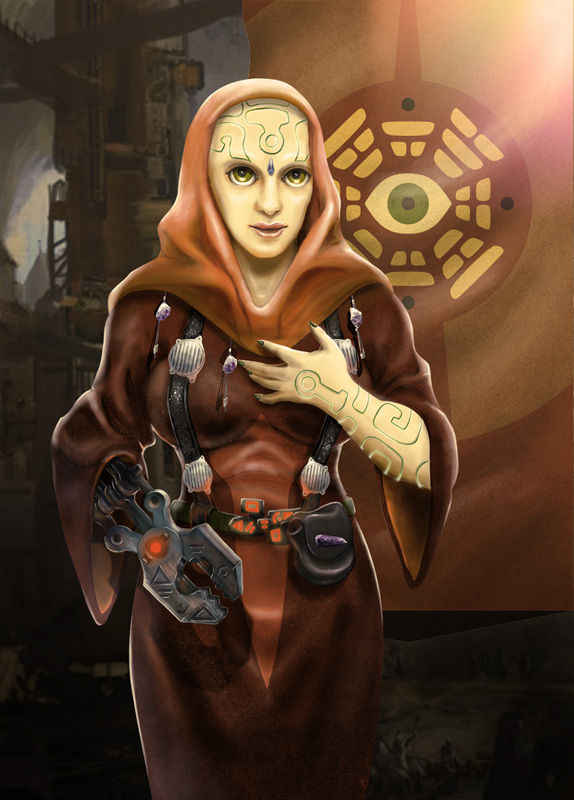 Her mechanical arm replacement is not only a functional tool, but also a powerful symbol of the Drokathon dynasty, similarly to Caratacus’ staff. While Amena’s influence and power is not as obvious as that of the Shepherd’s, the Path of Salvation may not even know how much it owes to the High Sunwalker and her tireless work.